In the 2018 Nissan Altima, you'll never be disconnected from the world around you. This popular mid-sized sedan is equipped with technology that lets you communicate while staying safe. The impressive technology is seamless, so you can simply get into your car and go. A bright and responsive touchscreen is positioned front and center in the cabin. 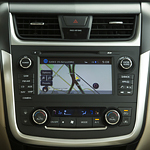 The infotainment gear is available in a few different configurations based on the trim level you choose. Apple Carplay and Android Auto are optional features that let you connect your smartphone to the car. Once connected, you can control your device from the integrated touchscreen or use voice commands. Hands-free calling and steering wheel buttons allow you to communicate without taking your eyes off the road. See how the 2018 Nissan Altima can change the way you travel by visiting us at Coyle Automotive Group in Clarksville, IN. We'll show you how these features work and let you experience them firsthand during a test drive. View Our Nissan Altima Inventory!